Serve up hot, freshly made crepes with the Carnival King CMPT16M 16" round portable crepe maker! Designed for easy, comfortable portability, the compact unit features a heat-resistant carrying handle. It also has an outer ring 2 1/2" away from the cooking plate, which helps distance employees and countertop supplies from the hot surface to prevent burns. Because of its portability, the unit is easy to use in the front-of-house to impress customers and then to store in the back-of-house after hours. 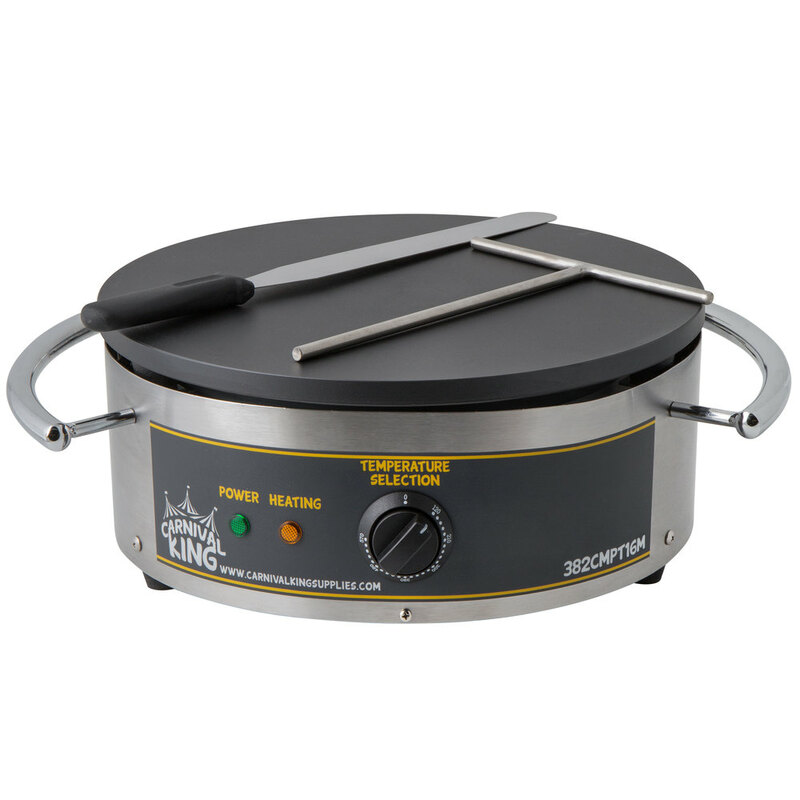 This particular crepe maker boasts a 16" diameter non-stick cast iron cooktop that's operated with an easy-to-use thermostatic control. The control adjusts the temperature from 120 to 570 degrees Fahrenheit, while warming and ready lights help you monitor the unit's operation. For safety purposes, the unit features non-slip feet to grip to the countertop during use. Plus, to help you whip up crepes, from sweet to savory, a T-shape metal crepe spreader and spatula are included. The crepe maker requires a 208/240V electrical connection for operation.